Released was the terrorism victim’s posthumous work. In the mother country Belgium. “Fukushima” suffered from the earthquake was filmed. The documentary film, depicting the East Japan Huge Earthquake, that the late Mr. Gilles Laurent managed, who was a Belgian film sound engineer (46 at that time) and died in March being drawn into direct involvement in the Belgian coincidental act of terrorism, was opened to the public in his mother country. 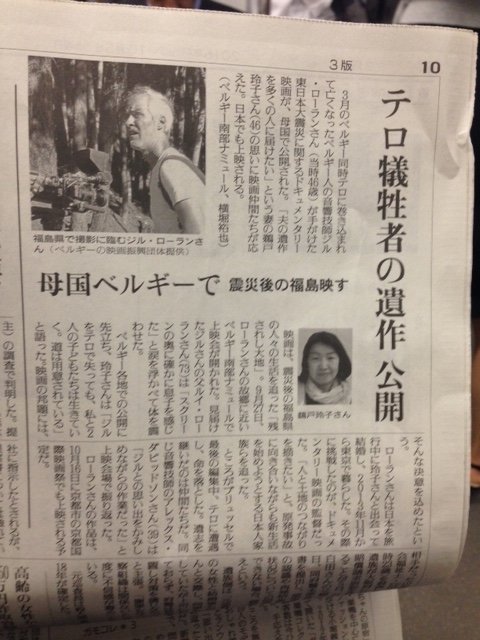 The film associates met the expectation of the late Gilles Laurent’s wife, Reiko Udo-san, who desired to notify his posthumous work to many people. This film also is to be put on the screen in Japan. The film is “Nokosareshi Daichi” (“Abandoned Land”) which follows the lives of people in Fukushima prefecture after the earthquake. On September the 29th, in Namur of South Belgium, near the late Mr. Gilles Laurent’s place where he was born and brought up, the film’s screening was carried out. Mr. Louis Laurent (73), who is Gilles-san’s father, verified the film, and said “I really felt my son in it at the inner part of the screen.” And then, he shook himself shedding tears. Before the film’s opening in every place, Reiko-san told us “Even though I’ve lost Gilles, two daughters and I continue to live a life. And our way to go is prepared.” She said that she concentrated her resolution on the Japanese title like the above. Mr. Gilles Laurent met Reiko-san while he was traveling in Japan, married her, and both of them began to live in Tokyo from November, 2013. Then he tried to be a director of a documentary film. “I want to depict the relations between human beings and their land, he said, and, he chased the Japanese families who were making every effort for the new lives in spite of the nuclear accident. However, Mr. Gilles Laurent encountered an act of terrorism, while editing the film finally, and lost his life. It was the film associates that succeeded to his wishes. Mr. Alex Davidson, who is the same film sound engineer as Gilles, recalled at the screening place, like this. “…..The editing works were those which I chewed slowly and savored the taste of memories together with Gilles…. .
Mr. Gilles Laurent’s work also is to be screened at the Kyoto International Film Festival in Kyoto City, on October the 16th. ・The middle part of photo: Reiko Udo-san.